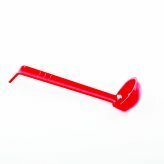 Cleanly and professionally serve soups, chowders, and chilis by using the proper serving tool. A ladle is used to stir, taste, and serve a variety of stews, sauces, and soups, both in the kitchen and in the front of the house. Opt for a Winco hinged cover to keep your food warm, and counters free of lids! Make the serving operation hands-free, so that your guests are not juggling their plates and lids! Colour coded ladles available to easily distinguish their uses! 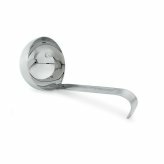 Kool-touch handles are ideal for heated pots, and for buffet lines and catered events, where mitts are not typically used. 1 and 2 piece metal ladles available for home use, commercial kitchens, cafes, grocery stores, cafeterias and buffets! With varying capacities from 2 oz. 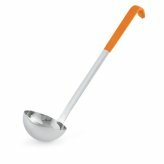 to 32 oz., Zanduco carries the ladle size for any type of task and type of liquid. For more serving utensils, be sure to browse through our spoons, spatulas, and tongs!